Spend a day by the sea on a full-day tour from Marrakech to Essaouira, a historic port that’s a UNESCO World Heritage Site. Visit an argan oil cooperative, join a guide for a walking tour through the bustling waterfront and medina, shop for souvenirs, then enjoy independent time to explore on your own. 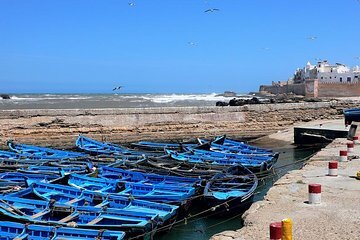 This full-day 11-hour Essaouira tour is available as a private or small-group tour, and it’s the perfect introduction to a vibrant city on the Moroccan coast. Choose between private and small-group options while booking—private tours offer a fully customizable experience, while small-group tours are limited to 15 people for personal service throughout the day. Meet a driver at your Marrakech hotel for 8am or 9am departure, depending on the option selected, then begin the 119-mile (192-km.) trip to Essaouira. The first stop is a women’s argan oil cooperative, where you’ll meet the worker-owners who extract precious oil from argan nuts. Continue to the coast, then stretch your legs on a walking tour of Essaouira’s fascinating port. See fishermen bringing in the day’s freshest catch, and boat builders shaping traditional wooden craft. Visit a seafood stall to try grilled fish or shellfish (own expense), then navigate the winding aisles of the local souks, browsing everything from carpets to olives and leatherwork. Private tours offer the flexibility to add trips to the fort of Borj el Barod, or the ruined sultan’s palace at Diabet, with options to surf, kitesurf, kayak, or visit the Iles de Mogador. Pause for lunch on your own, then spend the afternoon exactly as you’d like, sipping tea in a café on the Place Moulay, or exploring back streets and squares. At the end of the day, join the driver for the return trip to Marrakech, where this tour concludes with drop-off at your hotel by 7pm. Il convient de bien mesurer le temps de voiture qui est considérable mais inévitable... Il serait judicieux de faire un arrêt un peu plus tôt et de prévoir de faire tourner les gens aux places les plus confortables,ce que le chauffeur a fait aimablement compte tenu de mon âge. Journée FORMIDABLE !!! très enrichissante grâce à notre chauffeur d'une culture générale époustouflante !!!! Le voyage aurait pu nous sembler long , mais non, on a appris pleins de choses, de l'histoire, des astuces ....... Pas de chance le temps était gris, des travaux, il était censé être que notre chauffeur, mais il nous a guidé pour que nous passions la meilleure des journées !!! Et sur le retour pleins de conseils pour que le reste de notre séjour se passe bien, pour nos excursions que du coup nous aurions adoré faire avec lui également de déroulent bien ....... MERCI !!! !